In general, photographers don't like pictures that aren't sharp. Whether it's focus or motion, we usually try to make sure something in our photos is sharp. I was walking through Bangkok's Chinatown recently, not on an assignment just photographing with my Micro 4:3 gear. I was at the corner of Ratchawong and Yaowarat Roads photographing tuk-tuks, the ubiquitous three wheeled taxis that putter around Bangkok hauling freight and passengers. I have lots of tuk-tuk photos, some sharp, some not. 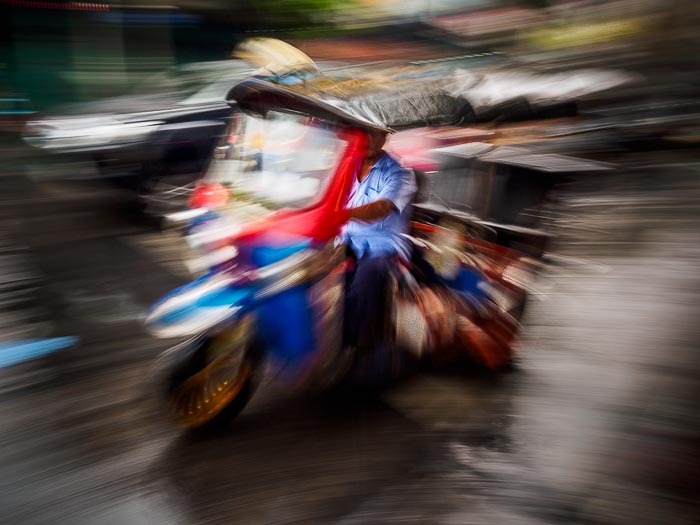 I usually photograph tuk-tuks at either a fast enough shutter speed that they're sharp and in focus or in a way that has some motion but is still recognizable as a tuk-tuk, somewhere around 1/30th of a second. This time I wanted something completely different, less literal and more impressionistic. I kept dropping the shutter speed and increasing the f-stop and ultimately made this picture. A quick check of the exif data shows it was made at 1/10th of a second, f10 at ISO 100. I kind of like it. It's not the sharpest tuk-tuk photo I have but it is one the most atmospheric. Sometimes less then perfect is better. I have lots of tuk-tuk photos in my archive.